i have a confession: i’m a picky eater. like, realllllyyy picky. and when i do finally eat something, i usually get distracted by a noise, a squirrel outside the window, or a chew toy, and forget to finish my dinner. the human is kind of a health nut, and that includes what she feeds me, too. for the past few months, she’s been feeding me a brand of all-natural grain-free refrigerated dog food that i like okay. sometimes i decide to be a picky-pants and ignore my dinner completely and go on a hunger strike…usually in an attempt to convince her to feed me more treats, but it rarely works *siiigh*. but i eat my food about 90% of the time, and it doesn’t make my skin itchy or dry like all the other foods i’ve tried. even so, she’s always keeping an eye out for healthier food options, because she wants me to live to 101 (duh). 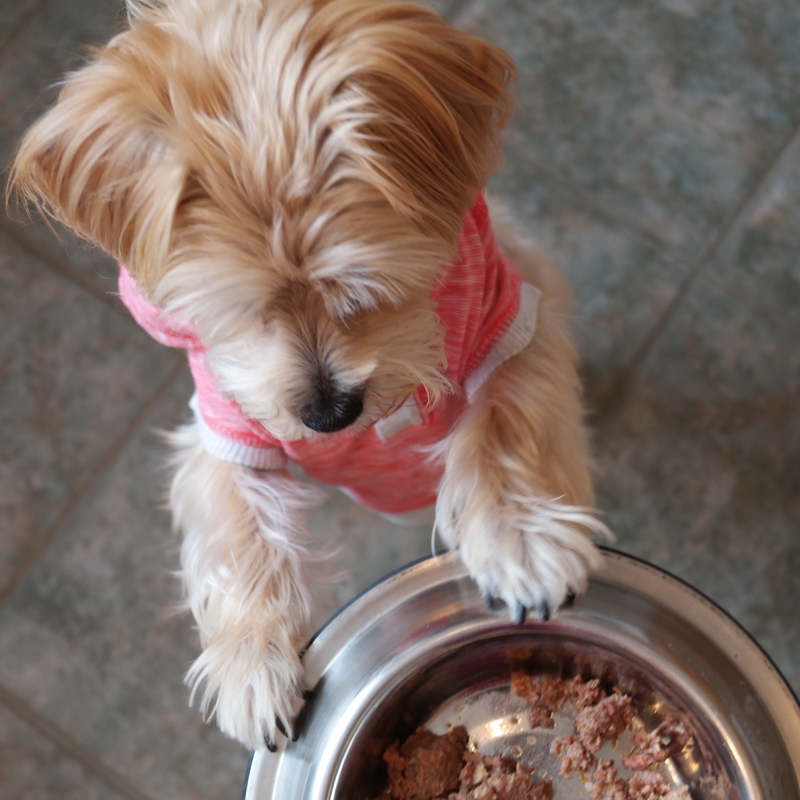 hmmm…could a raw food diet be for me? 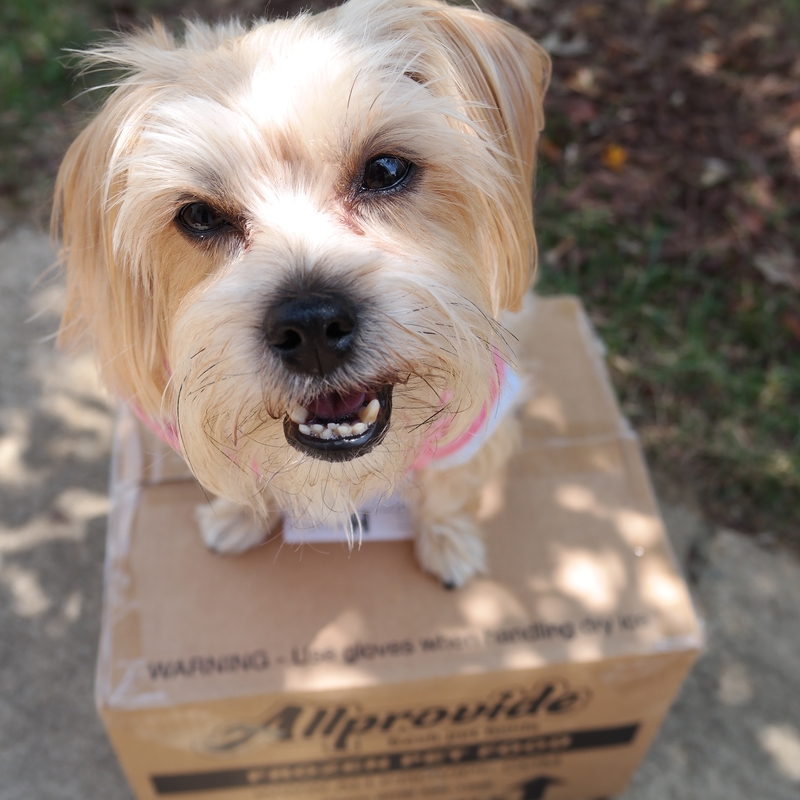 last month, the nice humans at allprovide sent me a message asking if i’d be interested in receiving a free shipment of their all-natural raw dog food. all i would have to do is 1) eat it (yeah! ), and 2) give it an honest and unbiased review. of course i said yes! this sounds like a pretty sweet deal to me. but she was willing to give it a go, and of course i was 100% on board! yummy food delivered to my doorstep? yes, please! about four weeks ago the mailman delivered my starter box. 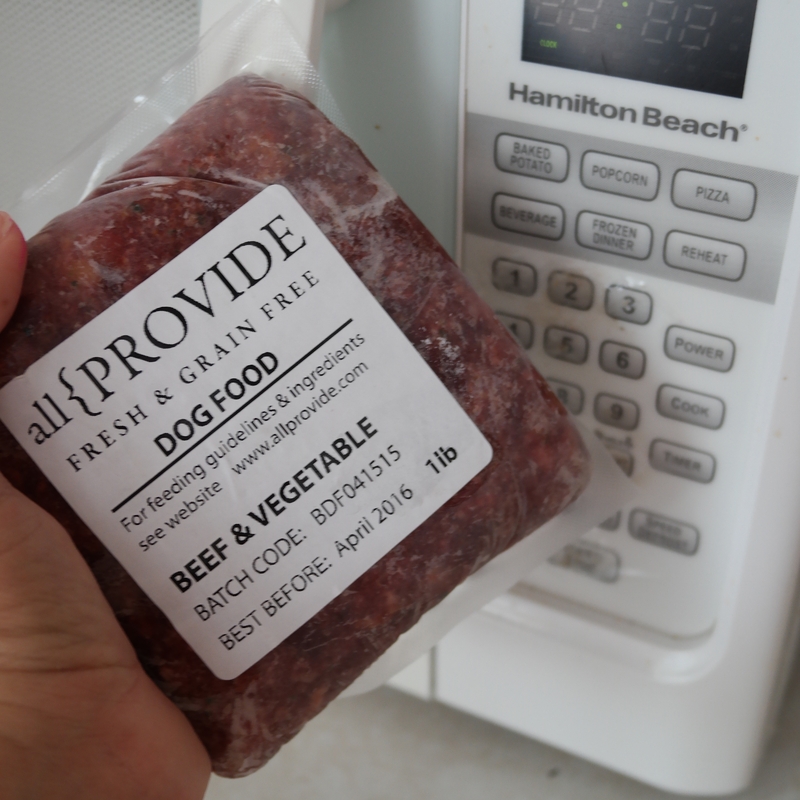 inside was a styrofoam cooler, and inside that i found a bunch of frozen vacuum packed pouches of FOOOOD! omg this is all for me! YESSS! 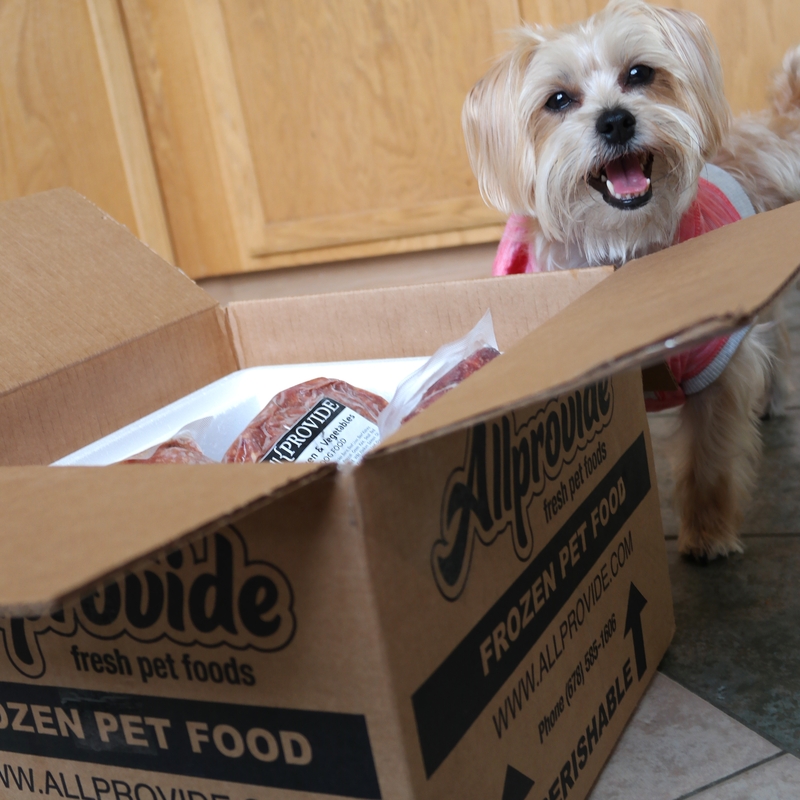 our freezer is pretty small (seriously, when are we going to pupgrade our old appliances?! ), so it took a while to clear out a space big enough to store all the pouches. we managed to make some room by finishing off some ice cream that was probably gonna go bad anyway (hehe). wait a second…you can cook this stuff?! 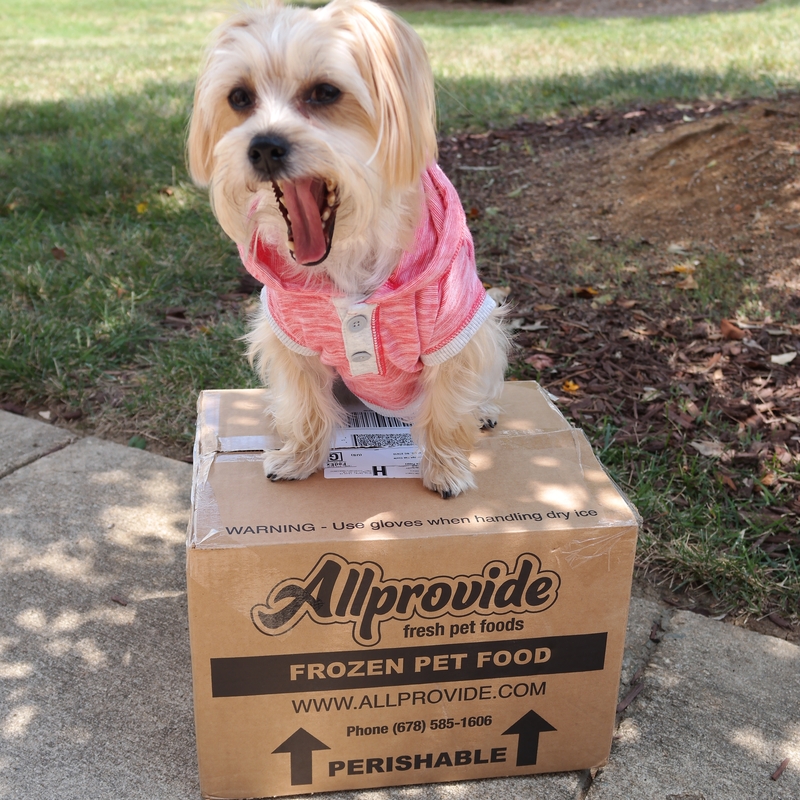 the instructions that came with my starter box said that small dogs like me usually prefer to eat the food cooked for the first few weeks (and sometimes just in general). hmmm, think i would prefer it if you sauteed this on the stove, stirring every 30 seconds. please. when the human saw the word “COOKED” she kinda threw a fit. other than the occasional fatty-pants homemade brunch on sundays, she rarely cooks for herself because she hates how much work is involved, and cleaning up is such a pain (can you say lazy? gee wiz!). …and being able to cook it rather than serve it to me raw was a win-win! day one: this stuff is flippin’ delicious! 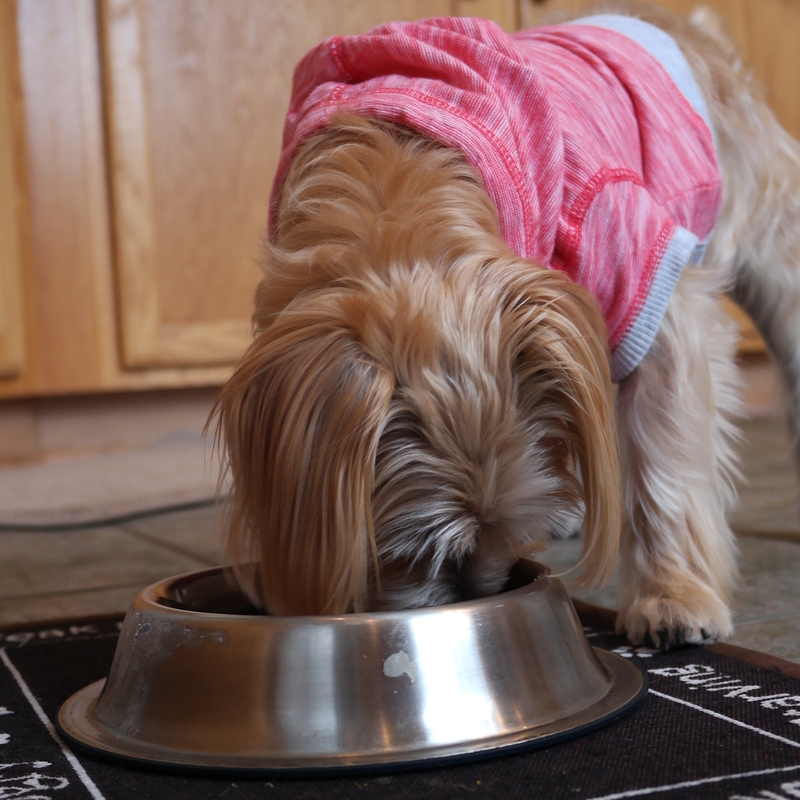 on the first day, she fixed my dinner bowl with a little bit of cooked allprovide chicken combined with my regular food (the best way to transition from one food to another without shocking your pup’s system). i ate all of the allprovide first (duh, it was delicious) and then nibbled at my regular food for a few minutes until i got bored and decided to go look out the window. for my next meal she did the same thing, but this time i got to try out the beef flavor. again, i ate all the allprovide first, picked at my regular food and then got distracted by something moving outside. #OMGSquirrel! for the next few weeks, she continued to feed me a small amount of allprovide combined with my regular food (which was becoming less and less appetizing). she didn’t see any major changes in my skin itchiness or my – hehe- poos, which is a really good thing because that means my body was ok with the new noms. …but would i like it after a week? 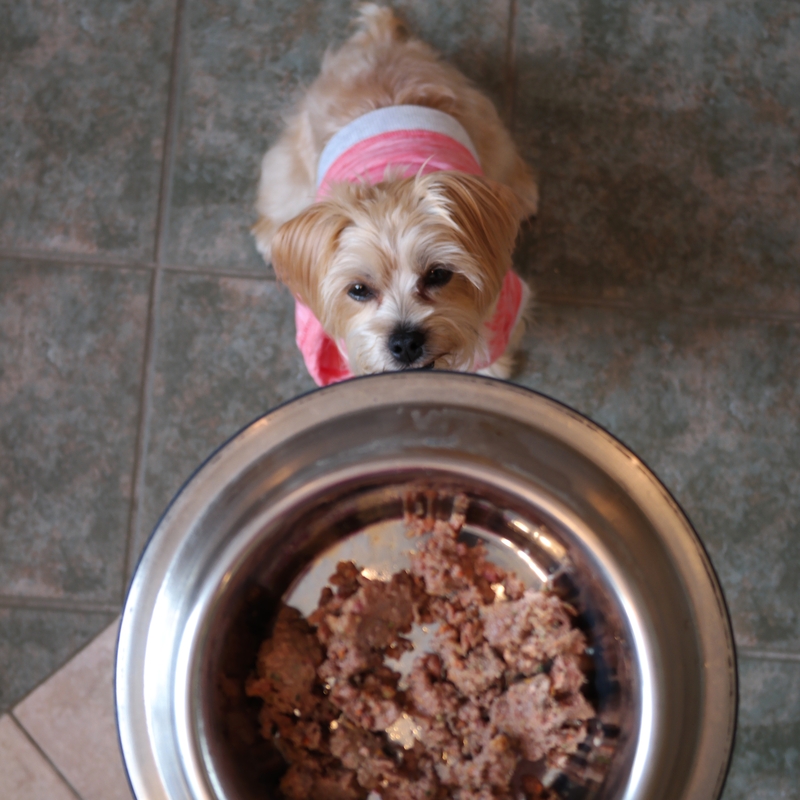 the next week, i got a little bit more cooked allprovide in my bowl combined with my regular *gag* food, and i always ate the allprovide first at mealtime. the biggest change the human noticed so far was that i was actually eating my food. well, the new stuff anyway. i was leaving more and more of my regular food in the bowl – in an attempt to demand more delicious noms, obviously. ok, so what’ll it cost me – er, her? she was kind of shocked that we had found a food that i would eat at every. single. meal. and not leave any of it in my bowl. so when we got back from vacation, she logged onto the allprovide site to check out the other food packages she could order. 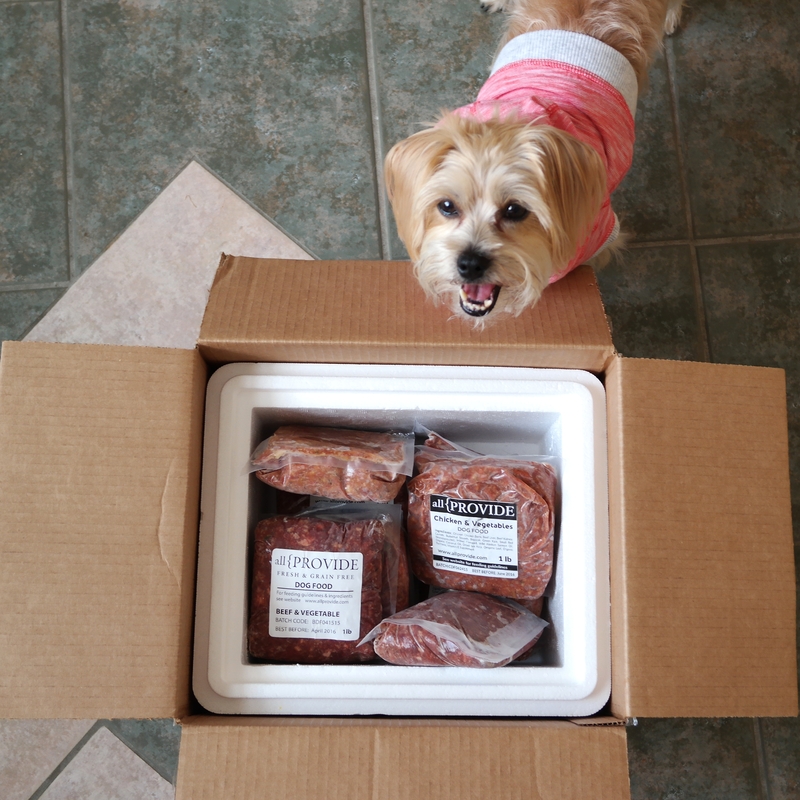 she knew that a raw food diet would cost a little bit more than my regular food (but i’m worth it, right?!). 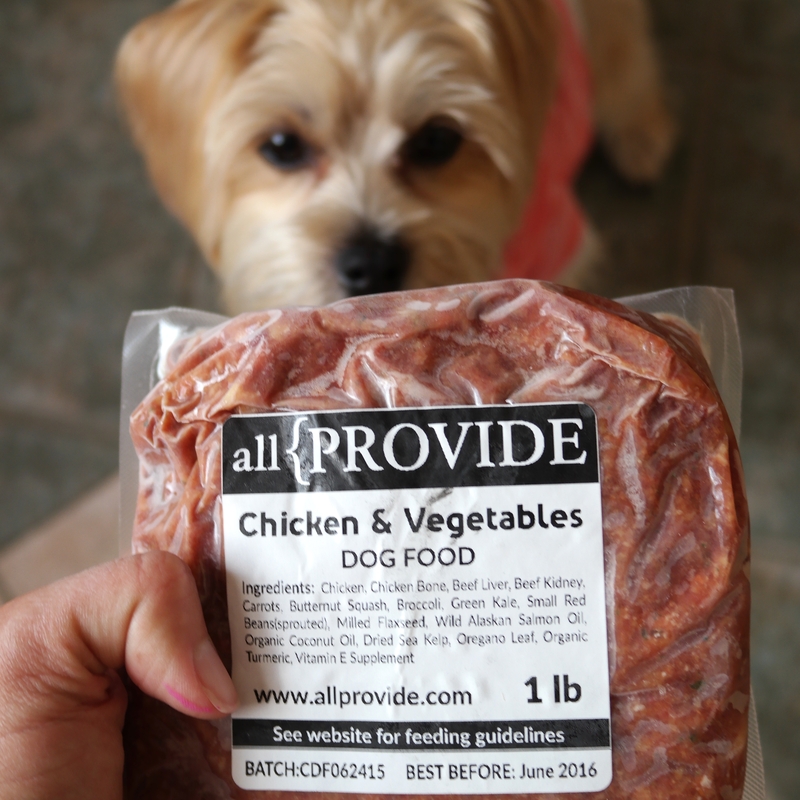 based on the feeding guidelines (2-3% of my bodyweight), if we ordered the chicken and veggie flavor it would be about $40 a month, which includes shipping. the refrigerated food i was eating before that i wasn’t super jazzed about cost about $20 month. so the question was, would the human pay an extra $20 a month to get allprovide delivered to my doorstep? to be honest, we – uh, she hasn’t decided what to do yet. $20 more a month doesn’t seem like a lot of money, but when you’re a self-proclaimed “young professional” with “a mortgage to pay” and “no one to help you out” *whine whine whine* you have to be “careful about where your money goes.” *blah blah blah* i don’t know much about this stuff since i don’t have a job, other being really stinkin’ adorable, or bills to pay. but oh well, what can ya do. so, it’s almost four weeks later and i’m still getting half allprovide and half of my regular food for dinner. and i’m still eating all of the allprovide, and leaving some of the other stuff in my bowl (seriously, will she get the message? i only want to eat allrpovide! why are you putting this other junk in my bowl!?). the human decided to keep feeding me this way until she figures out whether or not to switch me completely to allprovide. 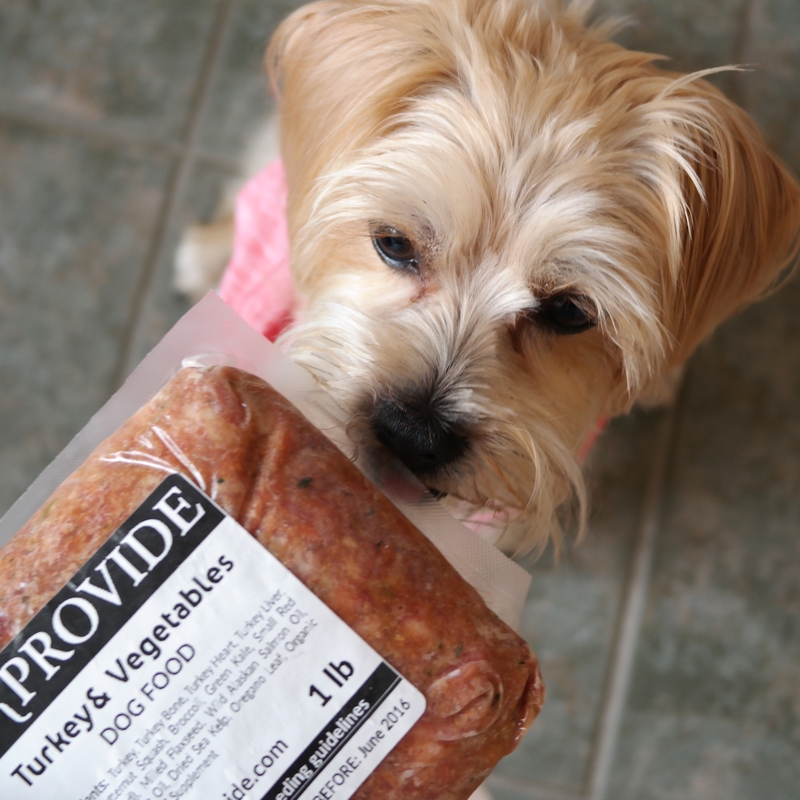 we both love that the food is human-grade, really healthy, made in the USA and sourced from local farms. but an additional $240 per year is a bit of a stretch for us right now. hmmmm… i guess finding some wiggle room in this so-called budget of hers will be the key to getting delicious noms delivered to my doorstep. no pawblem, i got this! want to give allprovide a try? get 50% off your first starter box (includes 3 lbs of each flavor: turkey, chicken and beef) with my code STARTERBOX! I guess you really liked the new food and are ready to leave the old behind. I remember hearing you were a bit of a picky eater, so this is pretty amazing. We will have to check this out! Allprovide is right down the street from me ! Maybe I can snag you some for next year’s meals. Or…how about asking for a job Rambo? I’m sure they’d love to have you do Quality Control!! hehe i would LOVE to work in quality control for them!!! hahahaha. they’re the best! I have a question. Obviously you have to thaw out an entire one pound package. How long does it stay fresh once thawed? I have a small dog and wouldn’t want to waste any. Thanks!